Eden Prairie has been to each of the last four Class 2A state tournaments and six of the last eight, taking home titles in 2009 and 2011 and finishing no worse than fourth during that stretch. Chaska? Well, the Hawks don’t have much of a history of playoff success. And by not much we mean miniscule. Comparing Chaska’s playoff results to Eden Prairie’s is a mismatch akin to an Edsel lining up next to a Lamborghini. The Hawks have bounced between Class 1A and Class 2A over the years, and deep playoff runs have been exceedingly rare against both big- and small-school competition. Chaska has never appeared in a state tournament, has advanced to a section final just once (in the 1996-97 season as a small-school team) and has reached the section semifinals just four times in its 43-year playoff history. Correction, make that five section semifinal appearances. The Hawks, seeded No. 5 in Class 2A, Section 2, parlayed three Blaine Warnert goals, the last coming in overtime, to upend No. 4 seed Eden Prairie 5-4 on Thursday night in a wildly entertaining quarterfinal victory in front of a near-capacity Eden Prairie Community Center crowd of about 1,200. Chaska’s last playoff victory came in 2014 when the Hawks were competing in Class 1A, Section 2. They beat Minneapolis 5-0 in a play-in game before being summarily bounced by Orono 6-2 in the quarterfinals. That last big Chaska playoff win Koster was referring to came on Feb. 22, 2007, when the No. 5-seeded Hawks upended No. 4 Minnetonka 6-3 in the Class 2A, Section 6 quarterfinals. Coincidentally, Chaska (18-8-0) will play No. 1-seeded and No. 1-state ranked (in Class 2A) Minnetonka at 4 p.m. on Saturday in the section semifinals at Braemar Ice Arena in Edina. “We feel like we can play with anyone in the state,” said Warnert, who missed most of the season with a back injury. With their 6-foot-5 power forward back in the lineup and rounding into top form, Chaska has a chance to beat most anybody. The Hawks have four players committed to Division I colleges on their roster, and their high-end players were more than a handful on Thursday. “We needed goals from our big guys, we needed nice simple plays from our role players, and we got contributions from everybody, including our goaltender (Justin Bach), who did a great job,” Chaska coach Dave Snuggerud said. There was nothing fancy about Warnert’s winning goal. He was stationed in front of Eden Prairie goaltender Andrew Dietrich and between two Eagles defenders when John Starkey’s shot from the point bounced off Dietrich and onto Warnert’s stick. Warnert also scored 39 seconds into the second period to put Chaska ahead 2-0. His goal late in the third period put the Hawks up 4-3. “He’s just a competitor, and he wanted to be the best player on the ice tonight,” Snuggerud said. Snuggerud, who has been involved with the Chaska program as an assistant coach or head coach for the better part of a decade, wasn't ready to call the win the biggest in the program's history. Biggest win in recent history? For sure. "This was their Super Bowl," Eden Prairie coach Lee Smith said. Junior Blaine Warnert, who sat out much of the season with a back injury, scored three goals, the last one coming in overtime, as Chaska recorded one of the biggest victories in the program’s history on Thursday by knocking off Eden Prairie 5-4 in a Class 2A, Section 2 quarterfinal in front of a near-capacity crowd at the Eden Prairie Community Center. Warnert, who has committed to play at Nebraska-Omaha, finished his hat trick, and the No. 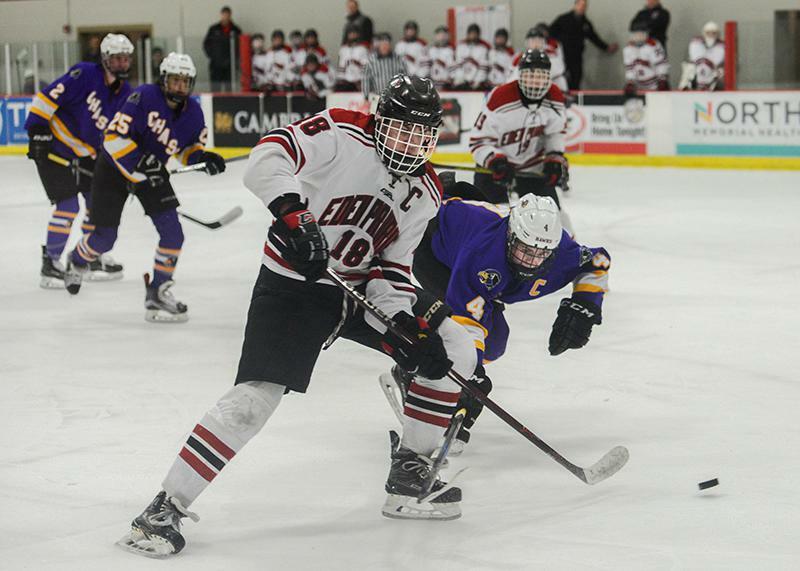 4-seeded Eagles (10-15-1), when he popped home a loose puck in the slot after the rebound from a John Starkey shot from the point bounced between two Eden Prairie defenders and onto Warnert’s stick. The victory was Chaska's first in the Class 2A playoffs since Feb. 22, 2007, when the Hawks beat Minnetonka 6-3 (the Hawks spent several years playing in Class 1A before bumping back up to the big-school class two seasons ago). Coincidentally, Chaska (18-8-0) will play No. 1-seeded and No. 1-state ranked (in Class 2A) Minnetonka on Saturday in the section semifinals. Eden Prairie rallied from a 2-0 deficit to tie the score in the second period, then rallied again the closing minutes to force overtime. 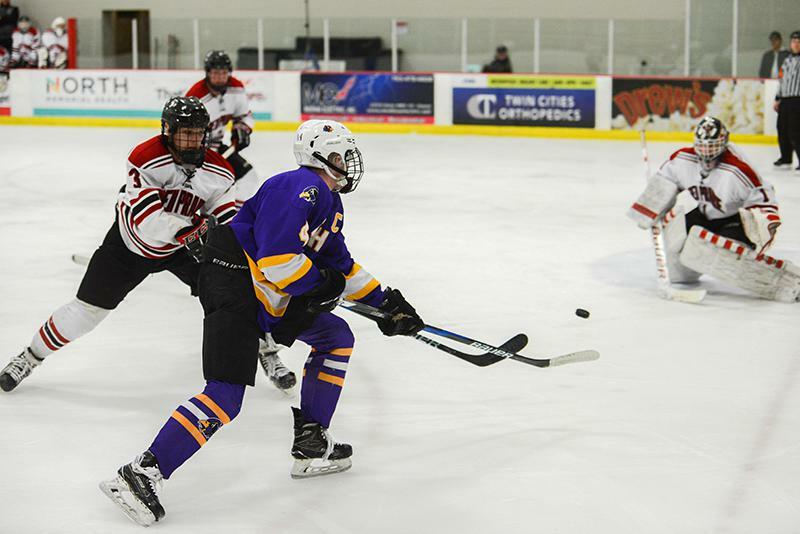 With Chaska leading 4-3 and Eden Prairie on the verge of pulling goaltender Andrew Dietrich in favor of an extra skater, the Eagles’ Chris Konin tied the score on a long-range blast. Eden Prairie outshot Chaska 46-27. 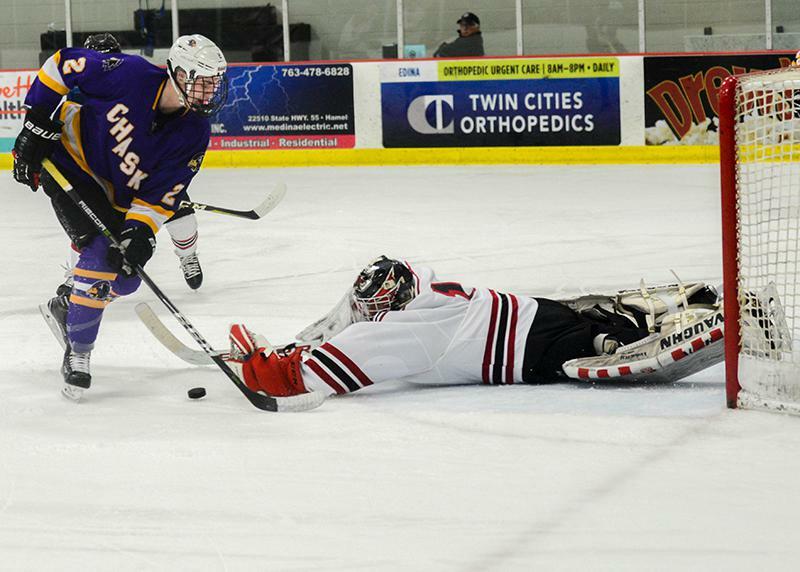 Dietrich finished with 22 saves while Chaska’s Justin Bach had 42 stops.